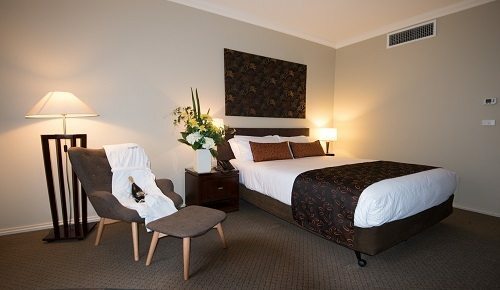 Hotel Rooms offer a Queen Bed, or a King-Split Bed (can be split to make 2 singles), and some rooms have an extra single bed too. The rooms are perfect for 2 guests, with the option of 1 extra guest where there is an extra bed (we offer a child under 12 free). Interconnecting Hotel Rooms are available for larger groups or families. Superior Rooms, our totally renovated rooms - completed in 2018 - are designed for 2 guests in total comfort and modernity. They offer a brand new experience for our Guests. Fitted out with brand new Plush Bedding, that will feel as if you're sleeping on a cloud, the renovated "Superior" room has been totally re-fitted with new furniture throughout. One Bedroom Apartments offer a King-Split Bed and a Queen-Sized Sofa Couch in the living room. These Apartments can accommodate up to 3 Adults or 2 Adults and 2 Children (under 12). A fully equipped Kitchen is included. Spa Rooms offer our guests a little bit of luxury at an affordable price! For not much more than a Hotel Room, enjoy your stay in a room featuring a corner spa set in a marble bathroom. Spa Rooms offer a Queen Bed and some Spa rooms have an extra single bed too. The rooms are perfect for 2 guests, with the option of 1 extra guest where there is an extra bed (we offer a child under 12 free). Interconnecting Spa Rooms are available for larger groups or families. Deluxe Spa Rooms are designed for those guests wanting even more luxury. These rooms are for 2 guests only. Why not pamper yourself in one of our Deluxe Spa Rooms? Executive Apartments offer it all. Plush carpeting, plush bedding, Spa Bathroom, Fully Equipped Kitchen. Our Executive Apartments are designed to accommodate 2 Guests with a whole lot of luxury and space.